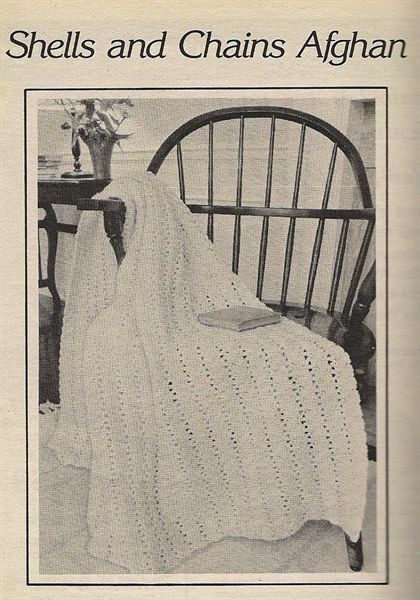 This afghan is a series of shells and chains worked throughout. The finished afghan measures approximately 39X70 inches. You will need ten 3 1/2 ounce skeins of 4 ply worsted weight yarn in your choice of color and a size J aluminum crochet hook or size required to obtain given gage. Row 1: Work 3 dc in 4th ch from hook,*sk 2 ch, work sc in next ch,,ch2,sk2 ch, work 3 dc in next ch, repeat from* across, ending sc in last st.Ch3, turn. ROW 2: Work 3 dc in first sc, *sk 2 sts, work sc in next st ch 2, sk 2 st work 3 dc in next st, repeat from * across, ending sc in last st, Ch 3 turn. Have you seen a pattern for the afghan on the TV show Friends, Season Three, on the back of Monica’s couch? It looks like columns of beige shells surrounded by green and beige columns surrounding burgundy paisley shapes which reverse to the opposite, beige columns surrounding green, etc., and it is trimmed by spiral fringe. sorry I haven’t seen that one but it sounds interesting. If you can get a picture of it I can probably copy it. chain 155 or 160 ..or. Thanks for visiting my site. As for the measurements of the afghan, I would do a swatch of about 3 sets of shells and chains then count how many stitches you have and then decide how wide you want your afghan to be and multiply that by the number of stitches in the swatch. What is the best way to fasten off at the end off a crochet project or when reaching the end of one ball of yarn and starting another? Thanks for visiting my website. When I need to start a new ball of yarn, I usually just leave about 3 inches of yarn then I crochet over it. I use the same method to fasten off.